Merkur is transporting you back to ancient Egypt with its latest slot release Queen Cleopatra and it offers a fantastic free spin game. 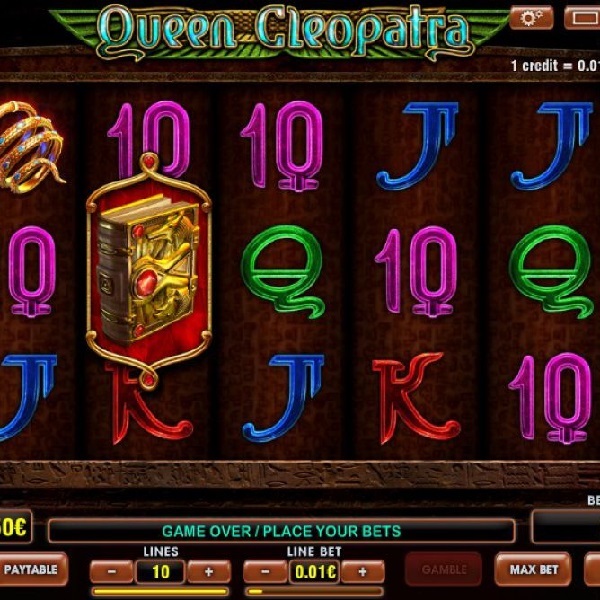 It is a 5 reel slot with up to 10 paylines. The reels are set against a gloomy temple entrance while the symbols include Cleopatra, a winged lion, a necklace and a bracelet. The wild and the scatter symbol are the same, the Egyptian Book of the Dead, and it can substitute for all the other symbols. It you can land three or more of the Book of the Dead symbols anywhere on the reels you are awarded ten free spins. Before the spins start the book will open to reveal a symbol that will expand to fill all positions on the reel every time it lands. It is also possible to retrigger the free spins.